In a wood outside Ancient Athens two pairs of young lovers discover that “the course of true love never did run mooth!” Encounters with the Fairy King and Queen, the real King and his betrothed Queen, the mischievous Puck, and a band of would be actors are the ingredients of this timeless comedy. Proudly supported by the Albury City Council through the Community and Cultural Grants Program, this is the first production of a new local amateur theatre company – The Other Theatre Company. A fresh script has translated the play into more Modern English making this the ideal production for those not familiar with the original language of the play. Bring the whole family and your favorite picnic, chair, or rug for a fun evening. Vendors will be on site to provide food and refreshments and a festive atmosphere. 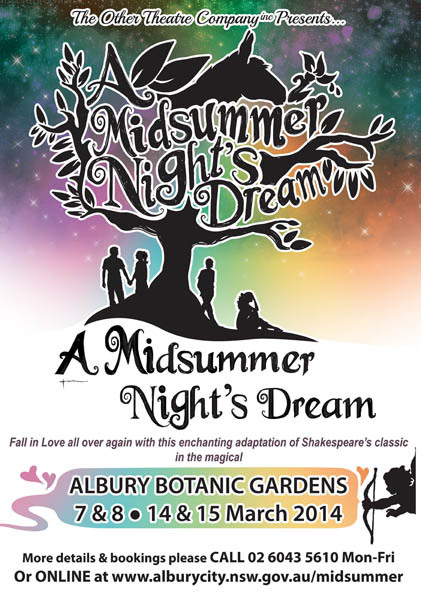 Featuring a cast of over 40 talented local amateur actors, musicians and singers with spectacular costumes, singing, dancing and music – this is a faithful adaptation of Shakespeare’s original play. Plenty of laughs guaranteed. William Shakespeare (1564-1616) was an English poet, actor and writer and is one of the most famous playwrights in the world. Throughout his life he wrote and collaborated on a grand total of 38 plays, 154 sonnets, two long narrative poems and many other verses. His plays have been translated to every major living language in the world and are performed more than any other playwright in history. No one knows when William Shakespeare’s much loved comedy A Midsummer Night’s Dream was first performed, although historians have estimated somewhere between 1594 and 1596. Since then this play has been performed hundreds of times to audiences all over the globe, in a variety of styles. The version you will see tonight is an adaptation of the original script and has simplified the Shakespearean language whilst still remaining faithful to the original text. We hope you enjoy it.